March 29, 1993, S Miller. 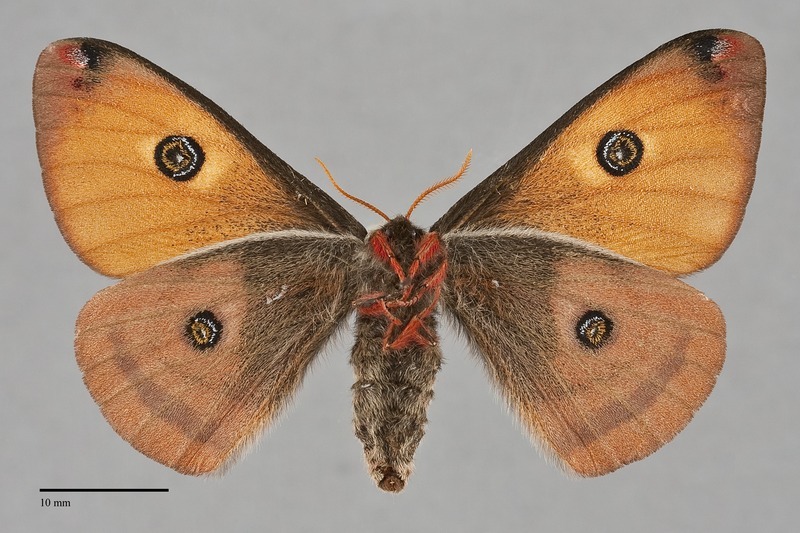 Saturnia mendocino is a large (FW length 27–30 mm) orange-brown day-flying moth with prominent discal eyespots that flies in southwestern Oregon during the spring. It is by far our smallest member of the subfamily Saturniinae. The forewing is orange-brown with a red, black, and white mark at the apex. It lacks all transverse lines. The hindwing is lighter orange with dark basal suffusion and black thin postmedial and thicker submarginal bands. 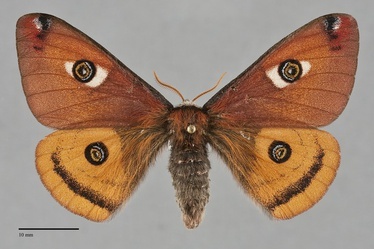 The well-developed discal eyespots of both wings are round with rings of orange, blue, and a central "pupil." The forewing spot is bordered by white on the basal and outer sides. The head is white, the thorax is orange-brown, and the abdomen is gray and brown covered with long pale hair-like scales. The antennae are broadly bipectinate in males and narrower in females. Saturnia mendocino can be positively identified by its early flight season, orange color, hypnotic eyespots, and lack of forewing lines. Similar Saturnia species occur in California but not in the Northwest. The last instar larva is yellow and has scoli or tubercles covered with orange hair tufts and longer white hairs. It is illustrated by Miller & Hammond (2003). Miller & Hammond (2007) also illustrate the young larvae that change dramatically in color pattern with each instar. This species occurs in dry forests and brushlands of California and western Oregon. It is common at both low and high elevations in the Siskiyou region of southwestern Oregon, but is rare and sporadic in the foothills of the Cascades bordering the Willamette Valley. This species is considered to be management sensitive, depending on madrone and manzanita as larval foodplants. Saturnia mendocino is limited to the central and southern portions of western Oregon in the Pacific Northwest. This species has a Pacific Coast distribution and only occurs in California outside of our region. The range extends south to the Transverse Ranges north of the Los Angeles Basin. The larvae of this species feed mostly on manzanita (Arctostaphylos spp.) and madrone (Arbutus menziesii) in the Ericaceae, but have also been reported on Ceanothus in the Rhamnaceae. The adults of S. mendocino are diurnal and fly during early spring. Pacific Northwest records are from mid-March through April. They do not feed as adults.